Voles (and other small rodents) comprise a vital piece of the puzzle that is the British ecosystem. Consumed by everything from Barn owls and Kestrels to Weasels and Wildcats, voles occupy a pivotal position in the food chain and their abundance has direct implications on the population dynamics of many predatory species. Particularly those of conservation concern such as Pine Marten and Wildcat. 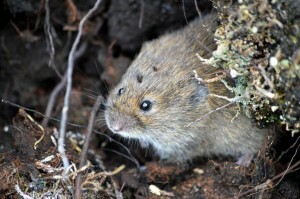 Vole populations often display strong cycles, increasing tenfold between high and low points, which when referencing the Field Vole occur every four years or so. This in turn has direct repercussions for predators and it has been shown that species such as Kestrels tend to fledge more young in years where voles are most numerous. Such population fluctuations are also the main driver behind the number of Short-Eared and Long-Eared Owls arriving in the UK each winter from the continent and likely have serious implications for many other species. Due to their importance within the ecosystem, voles are often of great interest to ecologists. Despite this, data on UK vole populations is still fairly limited and it is unknown as to whether populations are increasing, stable or declining. On top of their role as a limiting factor to predator populations, voles are also an excellent indicator of ecosystem health and as such, monitoring of these species can be used to make informed decisions regarding ecosystem management. Given these facts, monitoring of voles has increased in popularity in recent years though before data can be accurately gathered, identification of vole species should be perfected. As such I have decided to put together a short identification guide to allow easy differentiation between Britain’s two common vole species. The Field Vole (Microtus agrestis) and Bank Vole (Myodes glareolus). You wish to hone your vole ID skills, where do you look? Well if the names given to the species in question are anything to go by you would be forgiven for searching Bank Voles in the vicinity of banks and Field Voles in verdant grassy meadows. Now I am not for one minute suggesting these names are not justly deserved, Field Voles do indeed inhabit fields and I am sure that somewhere down the line a Bank Vole has taken up residence in a bank but truth be told however things are far less clear cut. Indeed, I have personally seen Bank Voles foraging in fields and their close cousin living quite comfortably on railway embankments. Difficult eh? In truth our two vole species are not all that picky when it comes to real estate, overlapping frequently and at times living quite contently alongside one another. Setting this aside however a brief search on Google does indeed suggest that each species has a particular habitat preference. Field Voles are listed by numerous sources as favouring grassland, heathland and moorland whilst Bank Voles reportedly prefer parks, gardens, woodland and hedgerows. It is however not possible to tell the two species apart based on habitat preference alone and to properly identify your particular romping rodent you must take a much closer look at the animal itself. Colouration is perhaps one of the best means of identifying Britain’s voles. Both field and bank voles are indeed small and “brown” though both differ in hue to such an extent to make identification possible. Field Voles as a rule appear much colder. They boast a grey/brown coat as opposed to the warmer, more rustic red/brown of the Bank Vole. The fur of the Field Vole also appears somewhat more unkempt, at times covering the ears and nose though after a good downpour or run in with a cat I am sure a Bank Vole could appear equally as bedraggled. The underparts of both species are both cream/grey and thus can make identification tricky though assuming your vole is not practicing handstands this becomes almost irrelevant. One last note on colouration is that some Field Voles can occasionally appear yellow/brown in colour and at first glance may appear rather similar to their ginger cousin. This can make things difficult but will force you to take heed of a few less conspicuous features that aid in the ID process. One of the most regularly cited aids when identifying voles is their tail. As its additional name suggests, (Short-Tailed Vole), the Field Vole boasts a relatively short tail. At least in comparison with the Bank Vole. The tail of the former constitutes only 30% of its total body length as opposed to the 50% of the latter. Alongside colouration, tail length is one of the best indicators associated with vole ID though as is so often the case, tails can be obscured relatively easily by vegetation. Should this be the case it then becomes necessary to examine additional features. Among these the head of the vole is relatively useful. I mentioned before that on a typical Field Vole the fur will obscure the ears. This is true, although the ears should still remain visible whereas on your typical Bank Vole the ears remain totally disguised under the ginger/brown coat. 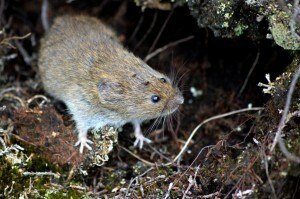 Voles are frequently misidentified as other rodents, particularly by those with little experience of the species in question. Among these, mice and rats are perhaps the most frequently encountered and thus pose problems for the less experienced. Truth be told one should never be able to confuse a Vole with a Rat though I have witnessed this happen on more than one occasion. Rats are much larger, boast a long tail, are pale brown in colour and showcase an impressive pair of ears. Additional features include a prominent protruding muzzle and more apparent beady eyes. Mice pose a little more difficulty. They are indeed comparable in size with Voles and particularly in the case of the Wood Mouse (Apodemus sylvaticus) are found in pretty much the same type of habitat. Like the much larger Rat however Wood Mice (and mice in general) boast much larger ears than voles. Appearing almost satellite-like as opposed to the stumpy ones of both common vole species. In addition, Wood Mice are also sandy in colour with pale white underparts as opposed to the various shades of brown present on our voles. Juvenile Wood Mice are much darker in colouration though the ears, pointy muzzle and “cuter” saucer like eyes should be enough to differentiate between the two. The same goes for the House Mouse (Mus musculus) though as a rule these are unlikely to occur alongside Voles, almost entirely bound to urbanised areas. Holding that thought however, I did once witness a Bank Vole raiding our bread bin. It is therefore wrong to assume that the rodent exploring your kitchen is by definition a House Mouse.